Hello Squirrels! (and everybody loving autumn fruits and nuts.). The acorn harvest is in the bag, we have already selected boxes to ship them in, are just waiting on labels from the printers. This is the season to be nutty. 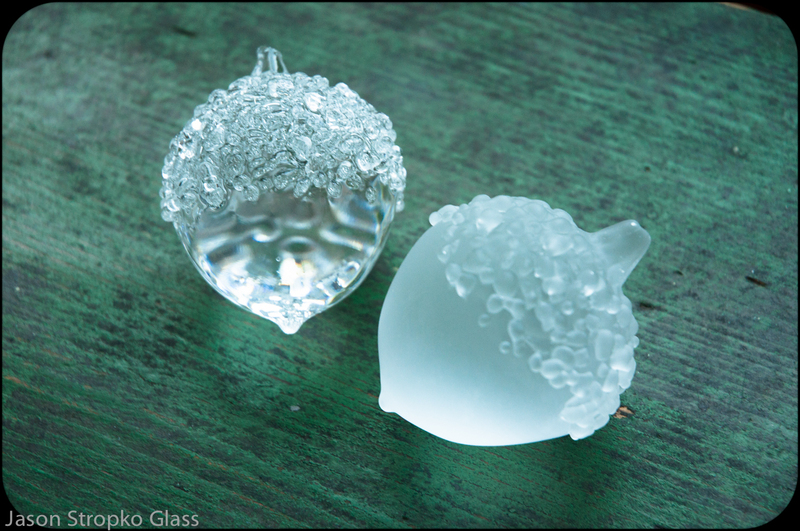 Clear acorns are proving difficult to photograph, but they are easy to admire. They have lovely light catching qualities and complement well with the etched acorns that we have recently added to the repertoire. We have a big, giant autumnal goal to get as many acorns out into the world this autumn and winter as possible. Everybody should have some of these precious nuts. Fun fact: Did you know that acorns are edible? They were an essential crop used to grind into a flour by Native Americans. Since we found out some months ago we have been rearing at the bits to go acorn harvesting (in nature, not the glass studio) and try them for ourselves. Have we already missed the acorns?! Another great fun fact: California is home to a great variety of acorns / Oak Trees! Want to get more connected? Love acorns so much you want to ask about a commission for your wedding table decoration? For a graduation ceremony? For Christmas? For a gift for somebody recently returned from hospital..?Acorns are fabulous, you can use the contact form below to say ‘Hi’ to Jason.